I did the 3d modeling and all of the molding and casting work. The autocannon is a reworked version of my older model which I did 5-6 years ago. Anthony helped me revise some of the detailing with a quick sketch which I then modeled in 3d and kept the weapon to the same size and overall profile as the original. The missile launchers are a variant of the launchers I made for my Mecha Front Lynx model. I extended the launchers and added an extra row of missiles. 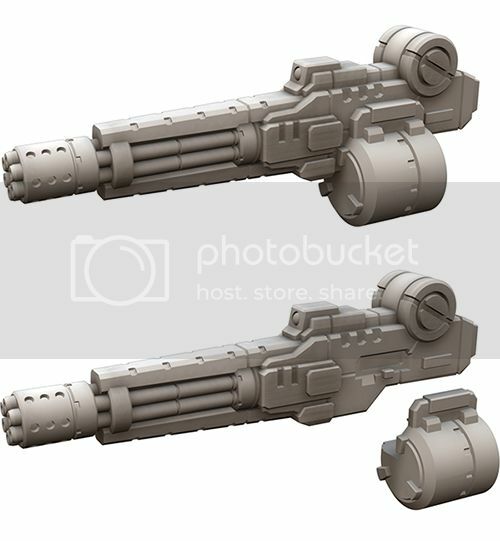 The Tsunami Class Beam Cannon is just a really big gun that'll fit larger models like Mobile Suit Gundam stuff and is also in a scale that's roughly compatible with GW's Tau Riptide. Casts of the Tsunami Beam cannon. Modified Tau models by games workshop shown for scale. You should make a version of that one that could be carried by a 28mm scaled model! Great to see that you're still doing new stuff, Jon! Yeah, I was thinking same thing. Where were printed these parts?